“Pristine beaches” is a cliché. 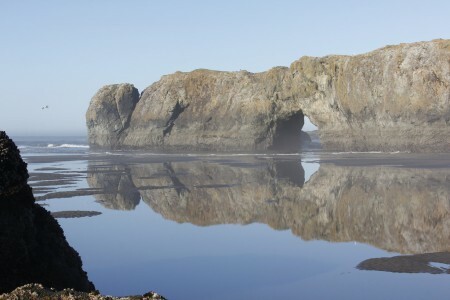 However, here on the southwestern Oregon coast, they actually exist. The beaches are nearly perfect and they are often devoid of people. The reason is the low population, the cold water, and the generally “lousy” weather. Really. No one lives here, no one swims*, and it always rains. But the beaches are beautiful. I started taking photos of them when all I had was a Canon G2 and then a G5, more or less point-and-shoot cameras. Having a digital SLR has changed that. The adage that a better camera won’t make you a better photographer is simply not true. At least in my case it’s not. 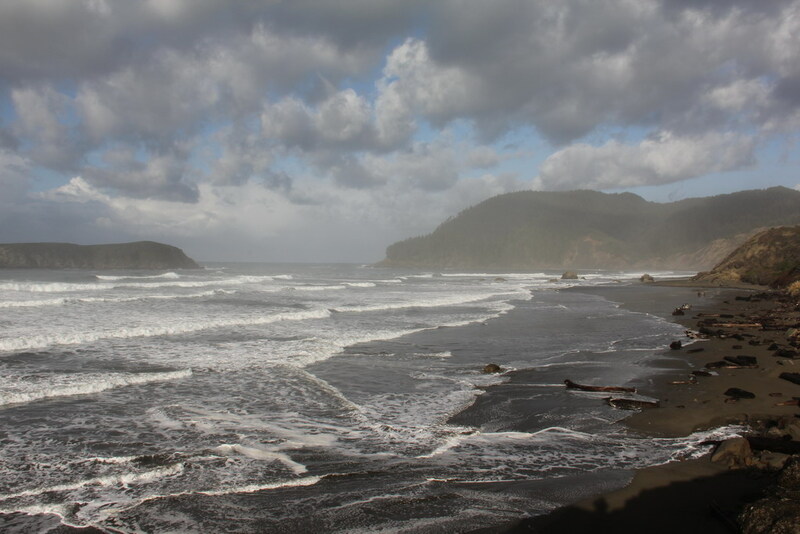 Some of the locals refer to the beach I show below as “Myers Creek” because a creek of that name flows nearby and this beach is where it empties into the ocean. But I call it Hunters Cove because that’s what the maps call the little cove that lies between the south side of Cape Sebastian and Myers Creek to the south. The beach is very accessible. There’s a turnout on Highway 101 that overlooks it, and I frequently see cars there that have pulled off the highway for the view. 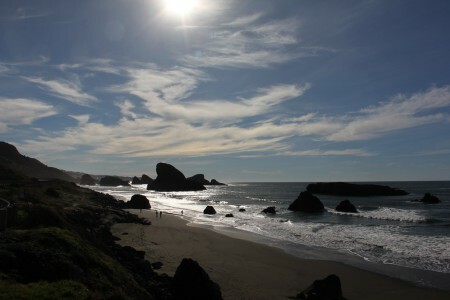 You’ll be giving yourself a treat if you’re ever in this part of Oregon and stop there yourself. All of these photos were taken with my former camera, a Canon 60D, using an EF-S 18-135mm f/3.5-5.6 IS STM lens. I took this photo in November of 2011. The view is looking north from the turnout on Highway 101. A storm was either moving in or moving out, I don’t remember which. The large hill to the right is Cape Sebastian. It’s the highest point on the Oregon coast. The rock on the left is part of what’s called Hunters Rock. It’s actually a small island. This is the same view as above, but taken on a nice day two months after the one above. 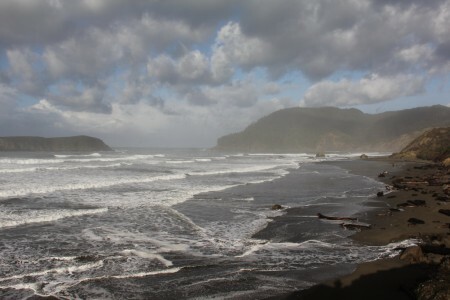 This photo is a view from the same turnout, but looking south, in November 2010, about a month after I got the camera and lens. It was a beautiful sunny day and you can see a few people came out to enjoy the weather and the beach. I was experimenting and had the circular polarizing filter on the lens for this shot. This is one of the many arched rocks on the Oregon coast and it’s there at Hunters Cove. I took this and the next two photos in June of 2011. My friend, Jennifer Mack, made me get out of my apartment that morning because she knew there were some terrific photo opportunities that windless morning with the bright sunny skies and the ultra-low tide. This rock is at least 200 yards long and easily visible from the turnout. This is the arch in the rock. The tide was so low that morning I could get very close. 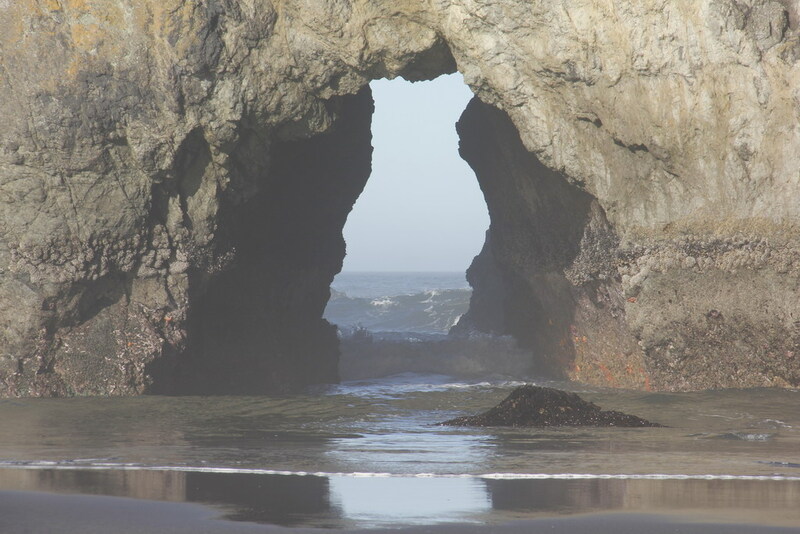 Had I wanted, I could have waded into the arch itself. While standing in front of the arch, I turned and looked south. 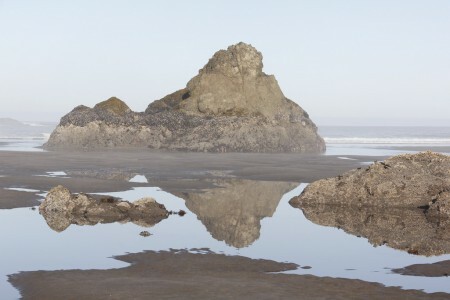 The windless morning allowed for almost perfect reflections of rocks of all sizes. 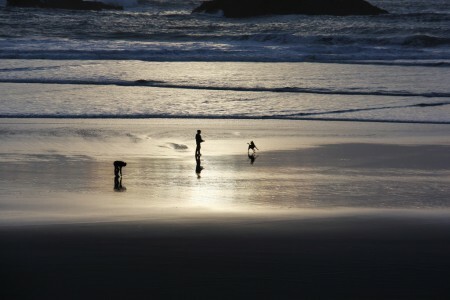 This photo, from 31 January 2011, was taken during one of those serendipitous moments I’ve had since I got my DSLR. I couldn’t have planned having these strangers showing up on the beach at sunset with their dog. This rock is directly west of the turnoff and just a few hundred yards out. 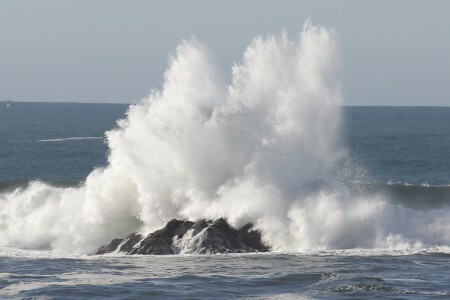 Some days, when the waves are breaking right, I can get some beautiful shots of them exploding over this very rock. Like I say, if you come here, bring your camera. 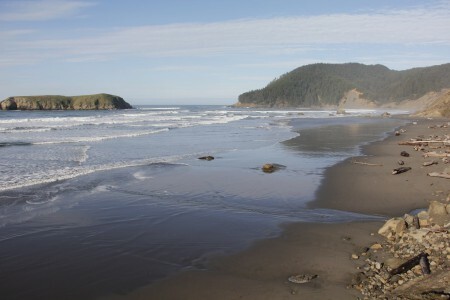 This entry was posted on Thursday, July 19th, 2012 at 12:04 pm	and is filed under Hunters Cove, Oregon beaches. You can follow any responses to this entry through the RSS 2.0 feed. Both comments and pings are currently closed.